Hi there – just wanted to have a little catch up on my development work since I posted in early September…. 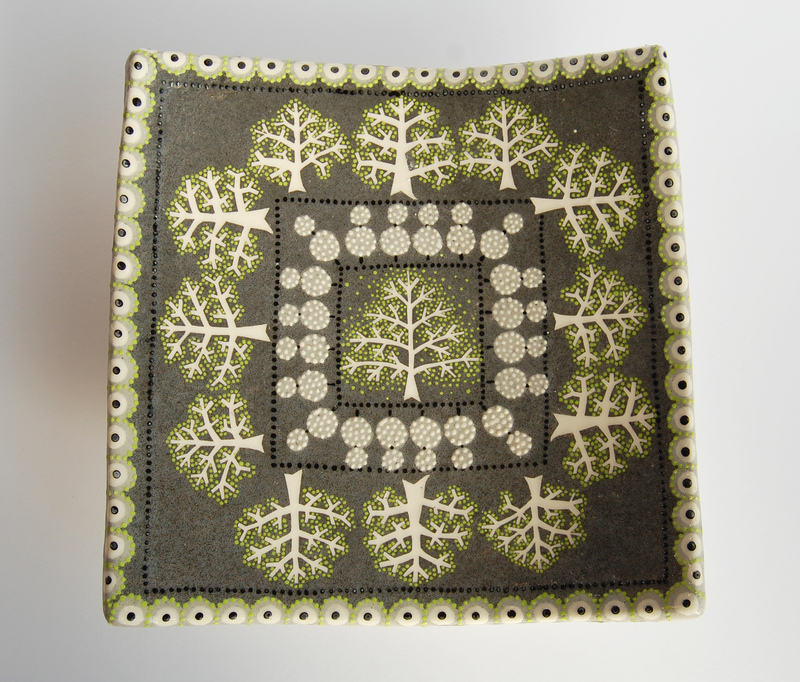 The image above is one of the new series of paper resist decorated larger scale items that I started on back then (it’s about 50cm diameter) – on the page ‘back in the studio’, I put some photos of the first pieces I made before firing…and now I have them out of the kiln! This platter is called ‘Out in the Dark’. 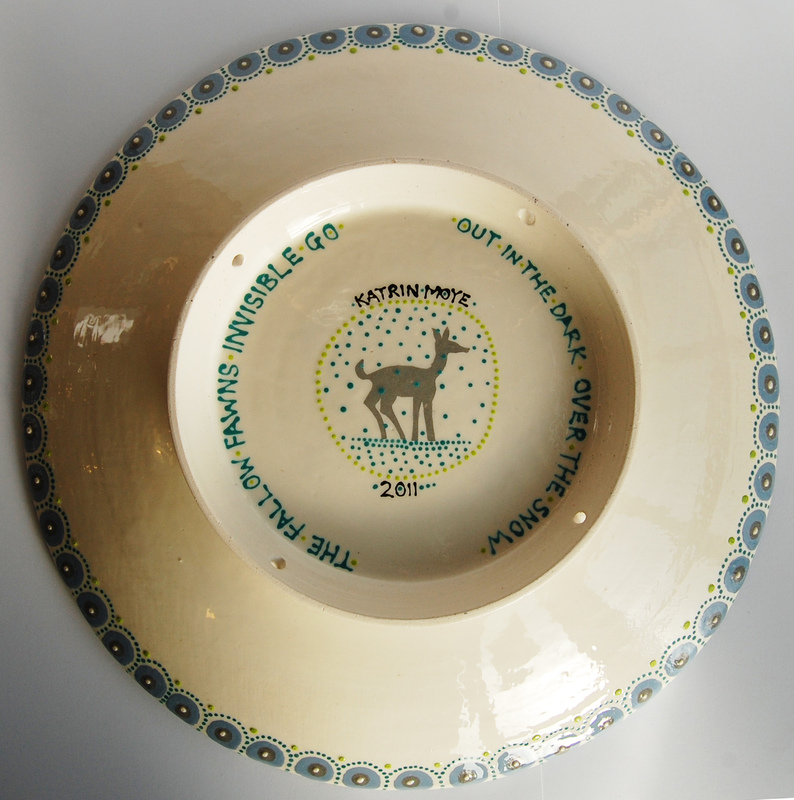 It was inspired by a poem by Edward Thomas, the first two lines of which are on the reverse of the platter: It looks like the second line is first on here…it should say ‘Out in the dark, over the snow/The fallow fawns invisible go’. 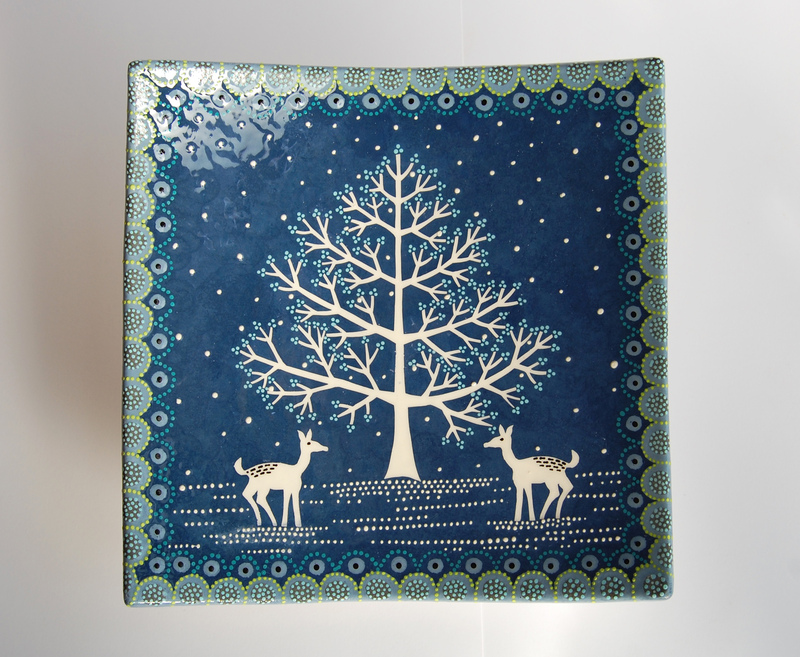 My next door neighbour happened to be in our back garden when I opened the kiln after firing the first of the new platters, and when he saw the wintery ones, he quoted these lines. I thought they were so beautiful, and fitted perfectly with what I was trying to convey with my imagery, so I did this platter with the words on. My neighbour has since lent me an anthology of Edward Thomas’ poetry, several of which have already given me ideas about new works… his writing is very simple and direct, which I really like, and he focuses on the ordinary things he sees whilst out walking in the English countryside – weeds, birds, stars, hedgerows etc. I really like that. There is such a lot to see in ordinary walks in the local park, or even up the road from my house to my studio, well worth recording and celebrating. So, this made me realise that I am already running behind on my funded period timetable – so I am thinking about extending the period from one to two years – the first year being immersed fully in the creative development side of the funded work, and the second, informed by my creative development, to focus on the design for manufacture side of things. I’m hoping that the Arts Council will agree to this! 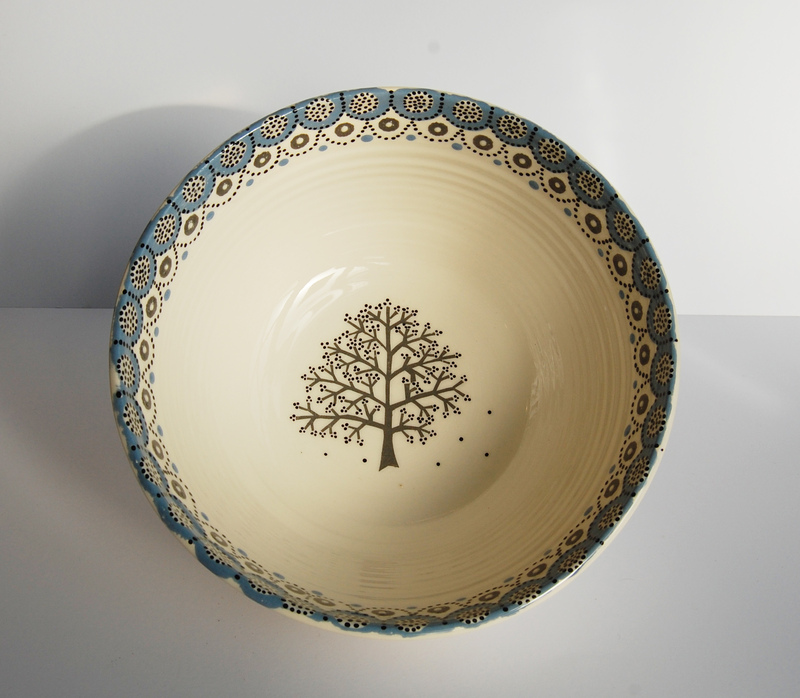 Having said that, I have spent some of this week thinking about getting some of my designs put on to manufactured bone china mugs, which I have been wanting to do for about eighteen months now…so I am going to see if two of my tableware designs, ‘Melanie’ and ‘Soren’, will be suitable to go on manufactured bone china mugs as transfers. This will be my first foray into design for manufacture after the design I did for ECP Ltd, which sold for them really well. I’m going to spend all of the money that I’ve made at my last two retail shows on buying roughly 800 of these mugs, so I really hope they are a success! If these first two designs go well, I’m thinking about building up quite a large collection of different designs on the same mug shape that will be exclusively mine to distribute and sell. The mugs should be with me by early January. 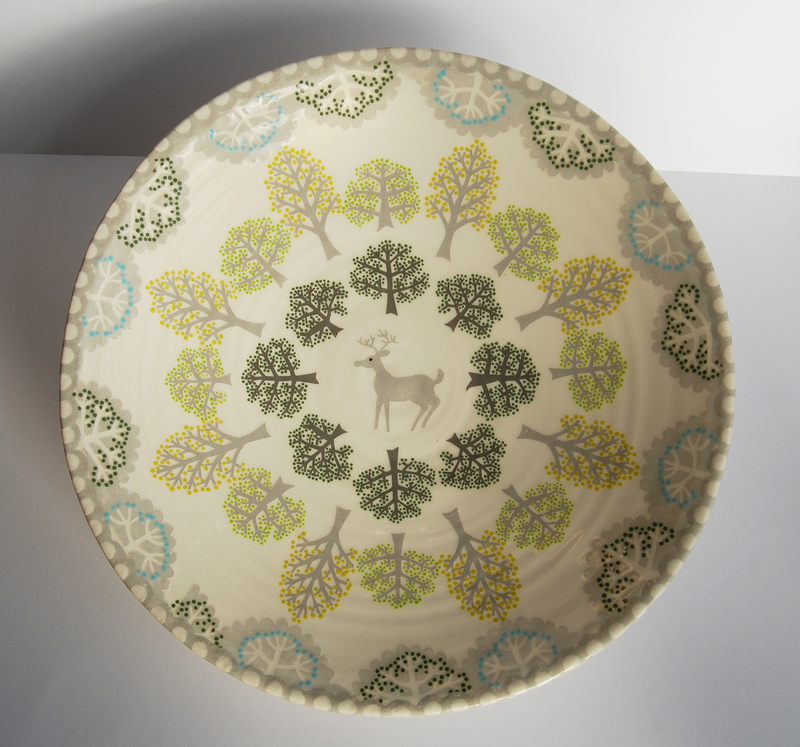 This is the ‘Melanie’ design on thrown tableware. Melanie is a very good friend of mine…it is also the name of a folk singer in the 1970s, who my dad liked…this pattern is for me very strongly reminiscent of the mid 1970s. 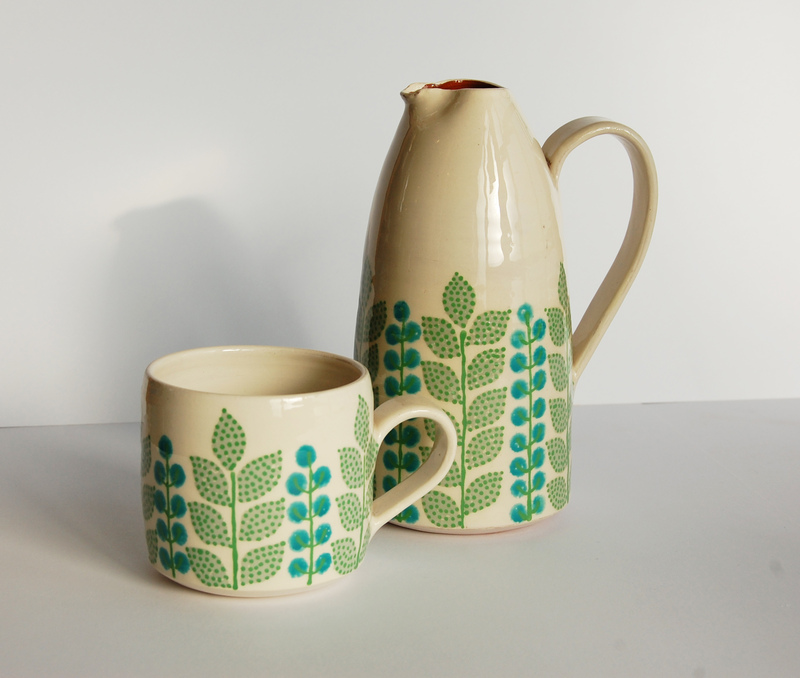 And here are a few more pictures of my new ceramics… Right, I’ll have another catch up after Brighton! Until then….hug a tree for me.